What is below my feet? 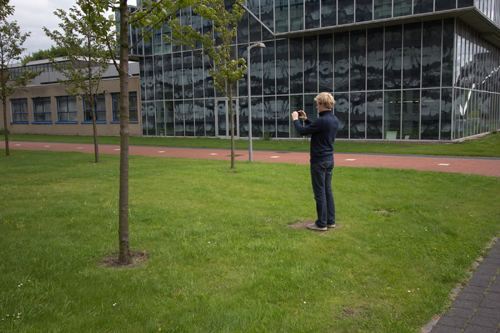 My master thesis project at the University of Utrecht was about the visualization of subsoil infrastructure using Augmented Reality on mobile devices. The primary focus was more on the element of perceiving depth and distances. 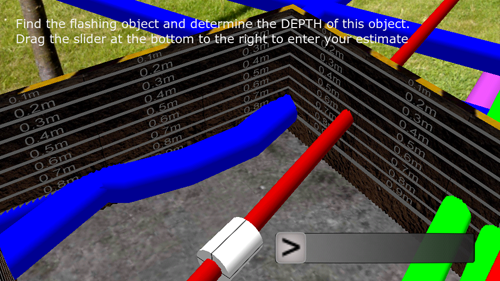 Is it possible to make accurate depth and distance estimations when using augmented reality to display the cables and pipelines under the ground? And are there visual aids that can help one to improve these estimations? But also depth. Can you tell how deep the white circle is under the ground? The entire project was created in Unity in combination with the Qualcomm Vuforia Augmented Reality plugin. This plugin was only used for the camera images, as Vuforia is an image based AR library and not sensor based. The data featured in the app was real infrastructure requested at the Dutch cadastral office. 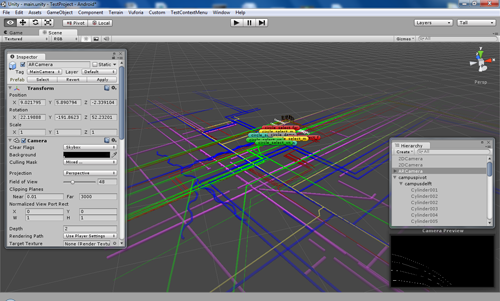 This data, consisting of many lines representing water pipes, gas pipes, telecommunication and electrical wires, etc. was imported in the Unity project and aligned to their Rijksdriehoek (RD) coordinates (the national coordinate system in The Netherlands). 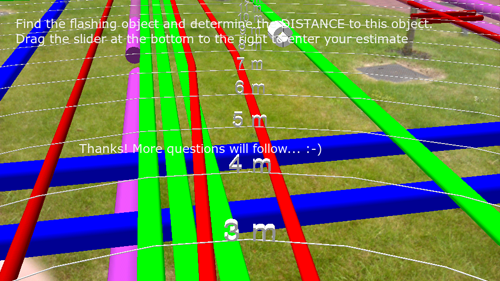 RD coordinates are cartesian, just like the UTM projection, and therefore the app also supports UTM coordinates. The results from the research, where many participantes were invited to perform a series of outdoor experiments, it became clear that judging distance is more accurate than judging (vertical) depth. For both distance and depth three additional visual aids were added in order to improve the accuracy. Most of these worked really well. For more background information please read the thesis. You can download a PDF copy of my thesis here: Subsoil on a mobile device (30 MB).